Seattle-based Precept Wine says its West Side Wine Co. canned wine will hit the shelves of Whole Foods Markets and some airport eateries. First, we got used to wine bottles with screw caps. Then sales of boxed wines soared. Now comes the increasingly popular wine in a can. When did canned wine become a thing? In the last year or two, it turns out. As people have started to get away from the idea that good wine must come from a glass bottle and be sipped from a stemmed wineglass, they are increasingly turning to more convenient and portable options. Taking advantage of the trend is Seattle-based Precept Wine, one of the state’s largest private wine companies, whose West Side Wine Co. canned wine hits the shelves of Whole Foods Markets and some airport eateries this week. Its chardonnay and cabernet sauvignon in a can sells for $4.99 each or $15.99 for a four-pack. It’s using California wine because California is still the best-selling domestic wine region. Wine in a can, though still a niche product, is the fastest-growing type of packaging for wine, according to Nielsen data provided by Precept Wine. Sales in U.S. stores came to $3.5 million for the 52 weeks ended Feb. 27, representing a 426 percent rise from a year ago, according to that data. That’s still small compared with the $6.5 billion of wine sold in glass bottles — a rise of 5.8 percent — during that same period. While canned wines have been around for years, they’ve not been hugely popular. But fueled by canned wines from the likes of Tualatin, Ore.-based Union Wine Co.’s Underwood label and Denver’s The Infinite Monkey Theorem, the category really emerged in the last couple of years. Canned wine is “especially appealing to men who consider it to be somewhat ‘beer-like’ and manly, but women are drinking canned wine, too,” Seifer said. Indeed, some canned wines already seem to be targeting different demographics. There’s a Mancan for wine bros, for instance. Whole Foods is gung-ho on the idea of canned wine, having carried the Francis Ford Coppola Winery’s canned Sofia sparkling wine for about a decade. But canned alcoholic beverages really began taking off in the last five years, said Devon Broglie, Whole Foods’ master sommelier and global beverage buyer. 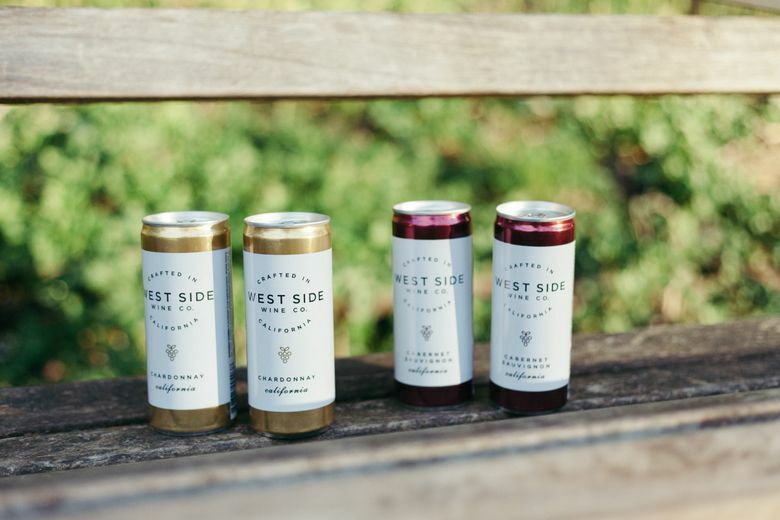 The company is selling West Side Wine Co.’s products, along with canned wines from other companies, in all its locations that sell wine. Customers now are more concerned about the quality of the wine inside the vessel rather than the vessel itself, he said. And people’s lifestyles are more casual these days. Starting this week, HMSHost, which runs restaurants and eateries in airports across the country, is also selling West Side Wine Co. canned wines in its counter-service and grab-and-go eateries in seven airports (not including Seattle-Tacoma International Airport).